Border Collie Rescue on Line Home Page by Terry Pratchett. Published by Doubleday. We take in, care for, re-habilitate, re-train and re-home unwanted Border Collies and Working Sheepdogs. We also provide commercially un-biased advice and information about the breed. We are in the process of updating and re-formatting this website to improve content and ease of navigation. This may take some time, so please excuse the various page layouts you will come across when viewing. Border Collie Rescue thanks Alysoun Sharpe and Shadowcat films for a donation of £1011 raised from sales of their video - 'To the Border Bred'. 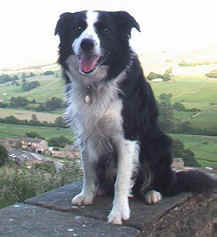 A shadowcat films video about the Border Collie, their work and relevant themes .